Delhi Chief Secretary, Anshu Prakash has filed a complaint to Lieutenant Governor Anil Baijal, against two MLA’s from the Aam Aadmi Party, for allegedly assaulting him at Delhi Chief Minister Arvind Kejriwal’s residence. Ajay Dutt and Prakash Jharwal have been accused of manhandling Anshu Prakash on Monday evening this week. 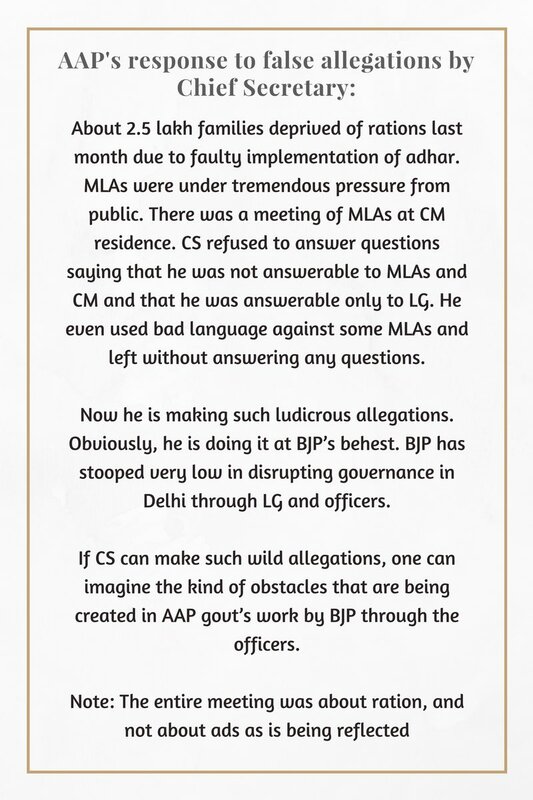 The chief minister’s office, however, has denied these complaints, “Delhi chief minister’s office strongly denies allegations by the chief secretary,” A statement read. “There was no incident of assault or attempted assault by any AAP MLAs.” There had been some reports that the party was in need of money, and that’s why Prakash had been invited, but they’ve since been denied. Instead, the party says that Prakash was called for discussions on the wrong implementation of the Aadhaar card, which, had resulted in 2.5 lakh families in Delhi without the necessities of food. AAP party has also alleged that the Chief Secretary had used abusive words during the meeting.